Tech Support Self Help - How do I add additional info for an on-campus event? 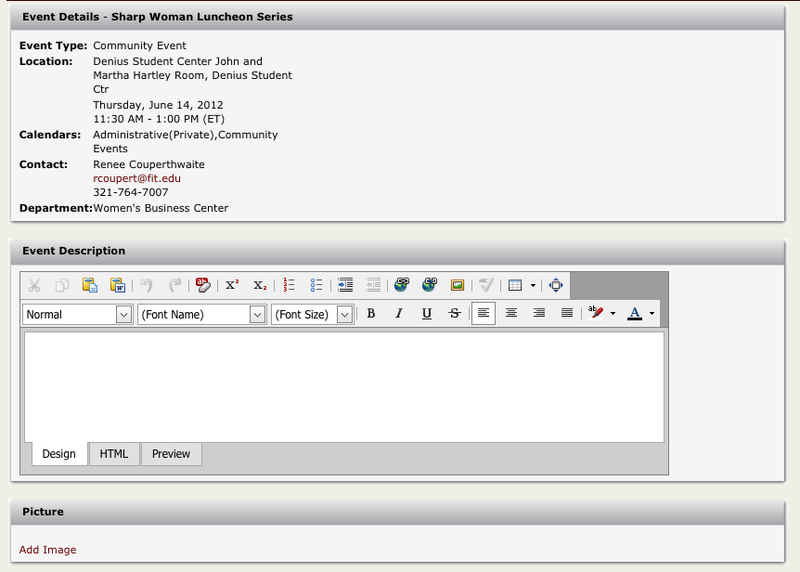 How do I add additional info for an on-campus event? General users must wait to recieve an email from the campus calendar to add additional information. Add additional information, such as a description, image, attachments. Note: If you do not recieve an email please contact the Calendar Manager associated with the calendar your event will be displayed on. Click the "Calendar Admin Login" at the bottom of the Campus Calendar Homepage. If you are in the Calendar View page, select My Options, then Login. Select "Admin", then "Manage Events." Click the event you wish to add indormation. Select the appropriate "booking" by checking the box and then click edit. Add the additional information and click Save. How do I request an event to be displayed on the Florida Tech Homepage? How can I filter events when viewing a calendar? How do I request more information from an event manager for an event?